Running a doctor's clinic is no easy task. Taking care of your patients and ensuring their health is a challenge enough, not to mention ALL of the other aspects associated with running a business. 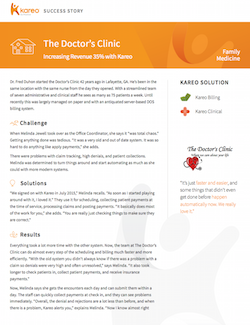 Download and read our latest success story to learn more about how you can make things faster and easier by implementing Kareo with your independent practice.